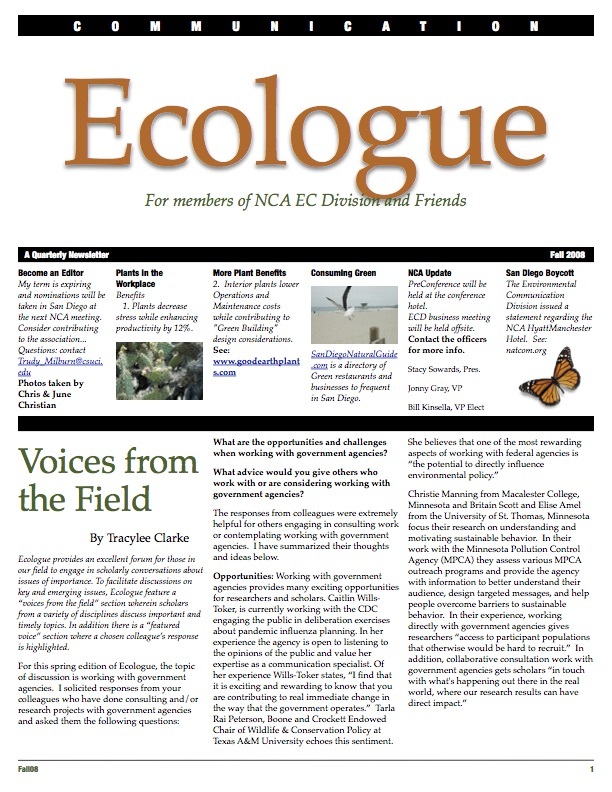 From time to time, folks associated with the Conference on Communication and Environment and the Environmental Communication Division of the National Communication Association have published a newsletter called Ecologue. With the help of Trudy Milburn, Alan Razee, and past editors of Ecologue, we are attempting to acquire copies of all past newsletters in order to make them available here. Here is what we have so far. All of these were published prior to the founding of IECA and they are not official IECA publications. However, because they were part of the Environmental Communication Network's resources, we are including them here. If any of you have copies of Ecologue not listed here, please let us know. Thanks.